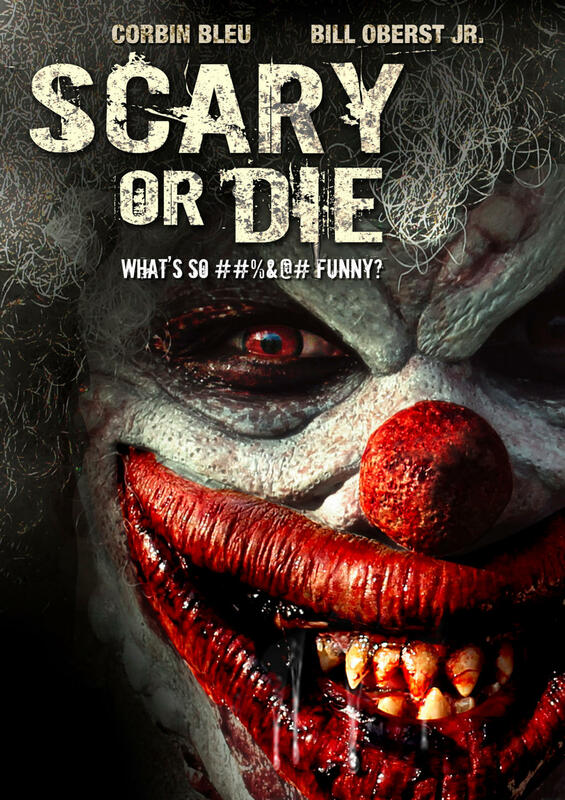 Scary Or Die – Flawed, Cracked… But Rare! Clowns are scary. Long before I got acquainted with Pennywise in It by King, as a young kid in the circus audience, I have found clowns creepy. The heavy make-up and the slapstick… they just make me wanna hide for cover. Though, I wouldn’t say I am coulrophobic, I am assuredly not a fan of clowns. So, quite naturally I was intrigued by the poster above and decided to check the movie out. That’s one scary clown and what better than a horror movie that plays upon a hidden fear of yours. Sometime in to the movie, I realized that it was an anthology of horror stories and not a single start to end fright flick. The Crossing: It is a story about a guy, Buck (Bill Oberst Jr.), his sidekick Keith and Buck’s girlfriend Connie. They are out in what seems like a road trip to Arizona in a battered pick-up truck. Buck is a brooding sort of guy and Keith is disgusting. It turns out that Buck (and Keith) hate Latinos and have taken it upon themselves to cleanse America of Mexican immigrants. Connie ends up being an unwitting accomplice to the murder of a Mexican father and son duo (legal immigrants) who were tied, gagged and bundled up in the pick-up and driven down to the Arizona-Mexico border where many an illegal crossing takes place… and where they are summarily executed by Buck and Keith. Connie is horrified of the act and understandably shaken. The crossing is covered by litter strewn by the immigrants and there are graves marked by crude wooden crosses. The graves seem to be the previous work of Buck and Keith. While Keith in his inebriated condition pisses on a grave, the jar of moonshine he had been drinking from topples over and seeps in to the grave. This seems to trigger a caustic reaction and quite unexpectedly we have a Mexican zombie uprising on the screen. The two guys and Connie are attacked and the zombies have their revenge on the men while Connie escapes only to be shot down by two border patrol men who assume her to be a stray zombie. Cut back to the desktop screen and hand on the mouse. This time the hand seems a bit pale and the skin a tad flaky. The cursor on the screen moves to click on another video titled Taejung’s Lament. See the Min-ah connection… I think she is based on Mina Harker! Note: There is a scene in which Taejung is walking through a tunnel with his MacBook while tracing his phone and on the opposite side of the road there’s a woman walking in a very zombie-like manner. It caught my eye (as I am sure it was intended to) because she drags her feet as she walks. The appearance is fleeting but I was reminded of the Mexican zombies and so took note thinking there might be some connection. Back to the hand on the mouse which seems to progressively rot… skin is flakier and the flesh has taken on a somewhat blue tinge… and the next video is clicked. This one’s called Re-membered. Re-Membered: The next story is not at all impressive. The walking woman makes a fleeting appearance again at the beginning of the story, blending into the background. The story is about a guy who seems to be a hitman. He appears to have hacked up some fellow, stuffed his remains in to a duffel bag and stashed the bag in the boot of his car and is out to dispose it off. He appears nervous and keeps glancing into the rear-view mirror as if expecting to see someone pop up in the back-seat. At this time we do not know that he has killed someone; that comes later. His nervousness and what appears to be some sort of knocking from the car’s boot makes him swerve while driving and is promptly pulled up by a passing cop car. The cop comes out to check on him and he almost escapes the cop by blaming his swerving on being preoccupied by his job issues… the cop’s about to leave when he too hears the knocking sound from the boot. The cop asks him to unlock the boot which he very nervously does. Here the movie flashes back to let us know about the murder, and how he packs the body in a duffel bag and puts it in his car… there is also a keychain shown which has a Necromancy symbol, that seems to belong to the victim. The hitman leaves a note next to the keychain for whoever ordered the kill asking him to leave the money there as his job is done. Back to the now… while the cop goes to the back of the car to check, the hitman opens his glove compartment and pockets a revolver. The cop returns signalling all ok and lets him leave. Intrigued and ever more nervous, the hitman stops his car further ahead and checks the trunk… the duffel bag is empty and the necromancer key chain and his note is all that remains. The note has an additional bloody scribble that reads “you cannot kill me”. Nervously, the hitman gets back in to the car and is horrified to see his victim (all sewed up, re-membered and undead) sitting next to him… he scrambles out and looks again to find that he is alone. As he searches around for his victim, the necromancer gets him from behind. This one like Taejung’s Lament was downright predictable…and unlike the Van Helsing twist, had no little surprise. The hand on the mouse is clearly undead now… and we move to the next story ‘Clowned’. Clowned: So, finally… here is where I would see the scary clown from the movie’s poster. This story is also the longest of the anthology. It has a first person voice over… which somewhat takes away from the scary part. I mean… if you want someone to be scared there is no point in explaining to the person what to expect. Once again the walking woman puts in an appearance but this time she is not dragging her feet all zombie-like… and turns out to be Shannon Bobo… though she has no relevance to the current story. There is this guy Emmett (Corbin Bleu) and his wife Kelly (Elizabeth Di Prinzio) who are out on the beach with Emmett’s kid brother Andy who Emmett in the voice over tells us he loves above everything else and would do anything for. Emmett and Andy are playing with a red beach-ball which rolls out under the pier and Andy runs over to get it; under the pier, he encounters a shadow and a child’s crying voice and immediately runs out scared. Emmett does not seem to pay any attention to Andy’s account of the crying child. Returning from the beach, we see a connecting element with ‘The Crossing’ clip… the guy outside Emmett’s house doing the landscaping is the Mexican immigrant shot dead by Buck in the first movie. Sort of sets the chronology of the clips. Andy’s birthday party has a clown invited to provide entertainment and he seems reluctant to leave after the party. Emmett finds him foraging in their refrigerator and bodily pushes the clown out of the house, in the struggle, the clown bites Emmett on his leg… with filed teeth. Kelly rushes to help him up and binds up the wound with antiseptic. The bite seems to cause Emmett a lot of trouble…and seems to slowly change him. He informs the cops about the clown and two cops are assigned to look for the clown. One of the cops is our hitman from ‘Re-membered’ and that seems to put the story of ‘Clowned’ as the first in the series of events. Emmett finds himself having weird dreams about Andy in trouble and also finds that his body is changing. His face takes on a painted appearance and he realizes he is turning in to a clown. He also seems to crave for Andy… in a hungry, cannibalistic way… and this scares him more than anything else. He decides to run away from home to protect Andy from himself. Kelly finds out she is pregnant with Emmett’s baby (which was conceived after Emmett was bit) and she is desperate to find Emmett and tell him. Emmett, now completely turned in to the scary clown in the poster, is leading a hobo’s life… and is struggling to keep himself away from Andy. He finally makes the policemen shoot him to save Andy. Kelly gives birt to Emmett’s baby and as expected, the baby apparently looks like a clown… and has huge clown feet. The viewers don’t see the baby… only the huge feet. Trivia: Emmett and Kelly… the names have a significance… Emmett Kelly was a well known circus performer who created the clown ‘Wearie Willie’. The appearance of Wearie Willie is quite similar to Emmett’s scary clown in the movie’s except for the scary face. This brings us to the wraparound story that is supposed to connect the other stories of the anthology. And by far, I find it the weakest story of the lot. Lover Come Back: The wraparound story is about this unnamed woman Shannon Bobo who is madly in love with a guy… and they seem to be happy and content with their married life. This story too has a voice over by the woman. The love story falls apart when her husband starts cheating on her and abusing her physically and mentally. As a child, the woman’s grandfather gave her a talisman of undying love which she always wears around her neck… Her ‘grandpere’ believed that she deserved to always have love. When her husband attacks and kills her and then dumps her body in a trunk in the woods… the talisman proves to be a sort of curse. She returns from the dead and is ever on the search for her husband who she still loves and hopes to be with. And that is how we see her dragging along in some of the frames in all the previous stories. She finally finds her husband making out with another women in his car… and attacks him… presumably killing him and so uniting with him in her undying love for him. Also, it is revealed that it is her hand on the mouse that we see surfing the website and playing the videos one after the other. The movie ends with her finally shutting the door on the viewers’ face. The story could have been so much better. it felt like a patchy effort at the best. The movie on the whole was fun to watch with my bro and me trying to link the stories… but in the end it fell short of what we expected. There was no solid connection… no real satisfaction after watching it. But, it wasn’t totally bad… it had is good moments in ‘The Crossing’ and ‘Clowned’… the little twist of Van Helsing in an urban world in an otherwise predictable ‘Taejung’s Lament’ and then it had the less than perfect, almost bad stories of ‘Re-membered’ and the wraparound story ‘Lover Come Back’. Bottom line: It is not unwatchable. The performances are not bad. The guy “Emmett” has to be named after Emmett Kelly. Can't be a coincidence. Wow! It is not often… Nah… Make that not ever that a celeb / an actor has commented on my blog! And I really liked your work. Wish you loads of success! Thanks for reviewing the movie. I played Buck in The Crossing segment. Love the title of your blog, by the way…it is so authentic and so true of humanity. Hmm, looks like a gory and thrilling flick. Many stories getting combined into one is indeed a difficult proposition and film makers don't usually get it right.